On Friday (Oct. 23), Mxit, the South African-born instant messaging service, once dubbed Africa’s largest social network, announced that it was giving up the battle to compete against other mobile messaging platforms. The company is “shutting down its commercial operations” reports Fin24, opting to hand over its IP and technology to the Reach Trust—a South African organization that uses mobile technology to solve educational and health challenges. Founded in South Africa in 2005, Mxit was a popular instant messaging service for millions of South Africans, before the advent of Facebook, Whatsapp and other social networks in the country. In 2012, CNN reported that Mxit had 10 million users in South Africa, outpacing Facebook and Twitter at the time, with 6 million and 1.1 million users respectively. But by 2013, Mxit’s hold on South Africa’s instant messaging market began sliding as Whatsapp began growing its popularity. According to Fin24, the company had 7.5 million active users in 2013, this declined to 1.2 million active users in July 2015. Mxit’s instant messaging service was initially built for “feature phones”—handsets that are enabled with basic web and multimedia functionality, but lack the advanced features of a smartphone—allowing millions of South Africans to access instant messaging through the mobile web. Michael Jordaan, a South African venture capitalist and chair of Mxit, told Fin24 that the company’s declining user numbers were linked to smartphones becoming readily available, and that Mxit users switched over to Whatsapp as they upgraded to smartphones. Speaking to Quartz, Arthur Goldstuck, a South African tech analyst, said that there was a lot that South African start-ups could learn from Mxit’s demise. “The first thing [Mxit] did wrong is that they became complacent when they were at their peak. They made the same mistake Netscape made in the 90s— it underestimated Microsoft, and two years Netscape was wiped out. 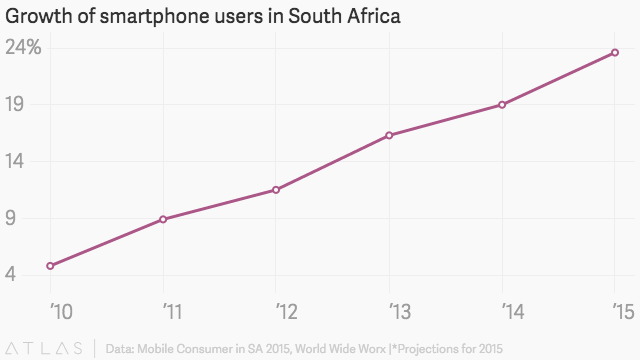 It was not only the rise of smartphones that led to Mxit’s decline, it was also the rise of other social networks. They woke up too late,” said Goldstuck.